Diesel fuel oil storage tank device for measuring diesel fuel level and converting it to an electrical signal to send to other instrumentation. Diesel fuel is a ubiquitous fuel used to power engines in many places on land and sea. Portable and mobile generators have diesel/generator oil powered engines to provide electrical power to equipment in remote locations, and emergency backup for buildings and factories during power network outages. Trucks have diesel/DERV powered engines and smaller ones which are incorporated into auxiliary power units and temperature control units for refrigerated goods. Tractors, crop sprayers, combine harvesters and other agriculture farm machinery run on diesel/red diesel/gas oil/off-road diesel oil powered engines. Ships and other marine vessels use diesel/marine gas oil to power piston engines and gas turbines for propulsion, heating and electrical power. Boilers use diesel/heating oil to heat water and provide a hot water supply and heating to buildings and factories. Trains run on diesel powered piston or gas turbine engines. Construction vehicles and machinery run on diesel/digger fuel powered piston engine. There are different grades of diesel to suit varying performance requirements and environmental conditions. Due to the relatively high viscosity of diesel at room temperature, it will begin to wax at lower winter temperatures. Some grades are specially formulated to gel at lower temperatures, so they can be used in winter conditions. Diesel is normally stored close to where the fuel is used in a appropriately sized tank, based on the practicalities and consumption needs of the diesel powered equipment. Diesel tanks are installed above ground, underground, indoors and outdoors. A tank installed above ground level is often elevated so that the fuel can be fed by gravity without the need for feed pumps. To prevent diesel from waxing at lower temperatures and in winter conditions, somes tanks are fitted with heaters to warm the fuel sufficiently to ensure adequate flow through feed lines. There are various means to measure the contents of a diesel storage tank, and the majority measure the height of diesel in the tank. Level based monitoring can range from a simple site glass tube mounted on the side of the tank, to an electronic level gauge which sends readings via a wireless network. The main sensor technologies used to measure diesel contents are pressure sensors, capacitive probes, ultrasonic sensors and radar sensors. The density of diesel will change with different grades, and environmental temperatures. This will have an effect on level monitoring technologies which may require adjustment or compensation, depending on whether it is weight or volume that is being measured, and whether the sensor technology is sensitive to density changes. Any electrical based diesel level sensor that produces a measurement signal can be connected to telemetry instrumentation where it can then be sent wirelessly to where the data is needed for managing usage and supply. If the diesel tank is close by it may be more practical to send the signal via wires either using an analogue signal or digital interface. A diesel level sensor is an instrument for measuring the height of a diesel fuel and converting it to an electrical signal which is sent to other instrumentation to display, monitor, log or control the diesel oil level. There are many different types of technology use to measure diesel level, there are sensors that can be mounted above the diesel such as a ultrasonic or radar sensor. These sensors bounce a sound or electromagnetic wave off the surface of the fuel oil and use the travel time to determine the distance from the surface of the diesel. 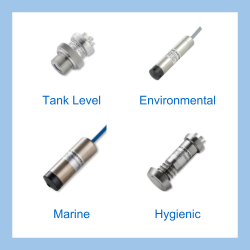 For diesel filled tanks there are sensors which can be attached externally, such as floats running up and down a diesel filled tube connected at the bottom of the tank, or a pressure sensor installed in a hole in bottom of the tank which measures the pressure generated by gravity acting on the diesel. Another method is to lower a probe into the tank and immerse it in the diesel. An example of this would be a capacitive probe which detects the changing capacitance charge as the length of the probe is exposed to varying proportions of diesel and air, or pressure sensors which measure the pressure generated by gravity acting on the surrounding diesel. Send us your enquiry for Diesel Fuel Tank Level Sensors to get assistance with this product type.